Established in 1986, GP Companies is the world leader in plunger pump products for high pressure cleaning, car washes, reverse osmosis/desalination, and industrial process applications. They offer the widest range of pumps available along with a full array of accessories and North America's favorite spray tip for high pressure washers. GP Companies has 70 employees at their 54,000 sq. ft. headquarters in Mendota Heights which includes their office, warehouse, and distribution center. GP Companies depends on technology every day to help keep their business running smoothly. As their business has grown over the years, they found it was becoming too much for one IT person to address their day-to-day IT issues. They had tried hiring an in-house support person in the past to support their growth, but were unable to find the right mix of higher level expertise in regards to their Novell network and infrastructure. After selling part of their company in 2006, GP Companies was at the point where they could not justify hiring a full-time person to perform everyday help desk activities. They also wanted access to an expanded knowledge base to address more complex IT issues. Joe Igo, IT Manager for GP Companies, felt it was time to take a different approach to supporting their IT needs. He researched managed IT services programs from several vendors and decided to partner with Marco. "It seemed like an easy transition to go with Marco's Managed Services Program because they were already familiar with our network," says Igo. "I looked to Marco for their Novell network support." Igo worked with Chad Vukich, Marco Technology Advisor, to determine the level of IT support and services needed to fit the company's needs. Marco's Managed IT Services provide their 70 computer users with unlimited help desk support Monday through Friday from 7:00 a.m. - 5:00 p.m. As the manager of three departments for their company, Igo views Marco as an extension of their business because the service allows him to focus on other projects and corporate objectives. Igo explains, "Everyone has the ability to go through Marco's help desk for their computer issues so they do not need to go through me. As Marco addresses our day-to-day routine maintenance issues, it frees up more time for me to focus on more project-oriented activities. Our users are also getting a quicker response to their issues. The response we receive from Marco is faster and more efficient." He further explains, "A Marco help desk representative is always available when I call. They have helped with a wide range of problems and always seem to have an answer for my specific issue. If they need to research an issue, they usually get back to me with an answer by the next day or sooner. In addition, the knowledge base we're tapping into is much better than what we've had before. Now I know why it was so hard to find one person to fill the help desk role at GP Companies. If the people from Marco's help desk don't have the answer, they have access to other knowledgeable IT staff within Marco that can help resolve the issue." 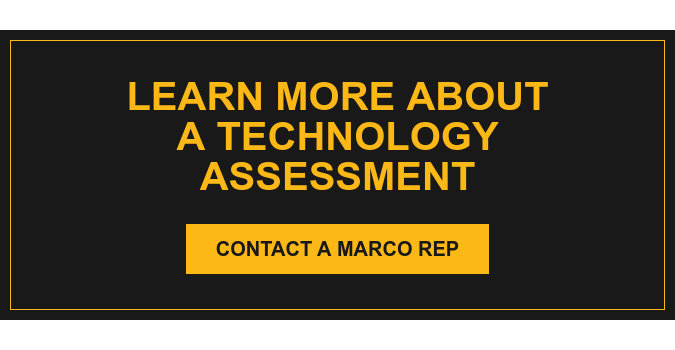 Through the Managed IT Services Program, Marco also provides GP Companies with an on-site technician every two weeks to perform a variety of IT services. Igo keeps track of issues that come up. He then communicates with Mike Nefs, Marco Networking Engineer, to take care of tasks such as setting up new desk-tops, network maintenance, and other network-related responsibilities. Igo comments, "I'm very pleased with the service Mike provides us." GP Companies receives monthly status reports including help desk utilization call volumes and network health checks. Vukich provides the company with an annual review to analyze their server and call data and keeps them abreast of the latest industry trends. "Chad keeps me informed of what's new in the industry," says Igo. "He's my window to information about what other companies are doing and the new technologies available that can enhance our business." Igo feels that Marco's Managed IT Services has helped them achieve their goals of operating more cost effectively and being more responsive to their users' IT needs. "I don't get much feedback from our users which means there are no problems," says Igo. "The bottom line is if you're not getting calls, the system is working." When asked if he would recommend Marco's Managed IT Services to other organizations, Igo replied, "If your IT situation is similar to ours, you should give it a try. I've already talked to a couple of companies and told them the same."